Many years ago a very good friend of mine married a Greek. I remember she and I making stuffed grape leaves (dolmas) with an egg and lemon sauce (avgolemono) for her pre-wedding party. I remember the sauce was a breeze, but the grape leaves were a bit of an undertaking. We made over 100 of them. Today I don't have any problem buying canned stuffed grape leaves. They're very flavorful. I always keep a can in the pantry. I usually buy Sultan brand from Wegman's. They make a great last minute type of appetizer for guests or a simple snack for the family. They can be served, hot, cold or room temperature. 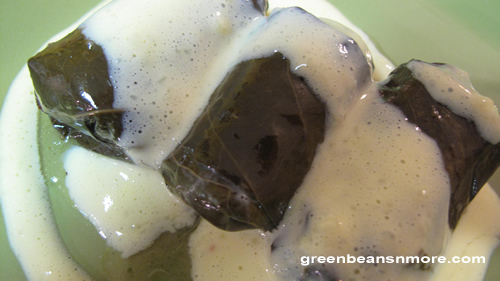 Stuffed grape leaves just have to have lemon and egg sauce over them to make them authentic. This sauce is three simple ingredients that are the perfect accompaniment. Whisk the yolks until they are frothy. Slowly add the lemon juice and continue whisking for another minute. While continuing to whisk slowly add 1/2 cup of the HOT broth. When it's incorporated add the remaining broth. Place the mixture in a heavy bottomed sauce pan and continue whisking until the mixture thickens. Don't let this boil. Cooks tips: I used to whisk this entirely by hand, no more. I use my hand mixer until I get to the point where the mixture goes on the stove. I've made this recipe many times and sometimes it just doesn't want to thicken up. I do add corn starch as necessary when that happens.